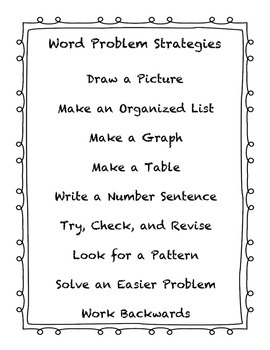 Help your students use multiple strategies to successfully solve word problems! 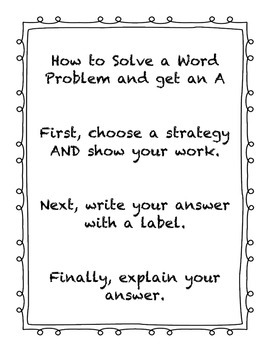 Review the steps to solving a word problem: 1) choose a strategy; 2) show your work; 3) write down the answer with a label; and 4) explain your answer. Review how to use various strategies. 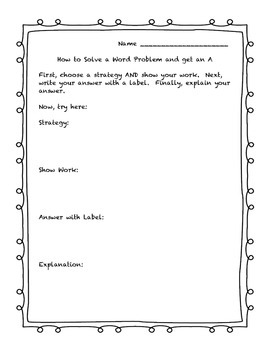 Students can solve word problems using this handy worksheet inspired by graphic organizers. Please rate me if you find this helpful! 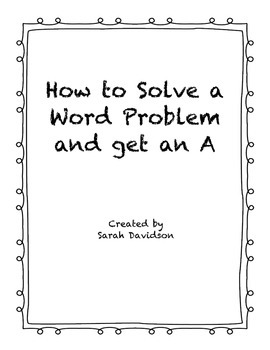 Word Problem Strategies by Sarah Davidson is licensed under a Creative Commons Attribution-NonCommercial-ShareAlike 3.0 Unported License.